Lehigh Mennonite Brethren Church, ca. 1947-1952. 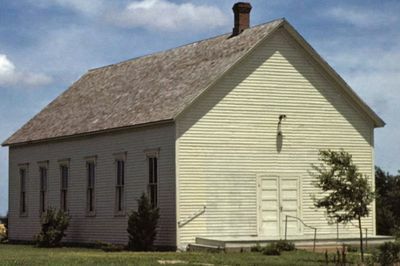 Lehigh Mennonite Brethren Church at Lehigh, Marion County, Kansas, a member of the Southern District Conference, was organized 27 August, 1884 under the leadership of David Dyck. The membership fluctuated from 100 in 1890, 23 in 1892, 42 in 1897, 100 in 1928, to 52 in 1953. Anna Enns, a missionary to Africa, was ordained in 1945. Ministers who served the congregation were Jacob B. Wiens, Cornelius Knaak, Jacob J. Harder, A. J. Boese, Gerhard Bartel, John A. Nickel, John A. Harder, Jacob J. Kroeker, G. A. Flaming, William Neufeld, and P. R. Lange. In 1955 the Lehigh congregation was amalgamated with the Gnadenau congregation of the Krimmer Mennonite Brethren Conference; the combined congregation in 1957 was operating as the Gnadenau Mennonite Brethren Church, with a membership of about 200. Franklin Jost was the pastor in 1957. Hiebert, P. C. "Lehigh Mennonite Brethren Church (Lehigh, Kansas, USA)." Global Anabaptist Mennonite Encyclopedia Online. 1957. Web. 26 Apr 2019. http://gameo.org/index.php?title=Lehigh_Mennonite_Brethren_Church_(Lehigh,_Kansas,_USA)&oldid=115843. Hiebert, P. C. (1957). Lehigh Mennonite Brethren Church (Lehigh, Kansas, USA). Global Anabaptist Mennonite Encyclopedia Online. Retrieved 26 April 2019, from http://gameo.org/index.php?title=Lehigh_Mennonite_Brethren_Church_(Lehigh,_Kansas,_USA)&oldid=115843. Adapted by permission of Herald Press, Harrisonburg, Virginia, from Mennonite Encyclopedia, Vol. 3, p. 313. All rights reserved. This page was last modified on 16 March 2014, at 07:50.